For anyone embarking on his/her journey toward the PMI-ACP exam, one of the first hurdle is to get the right study material. 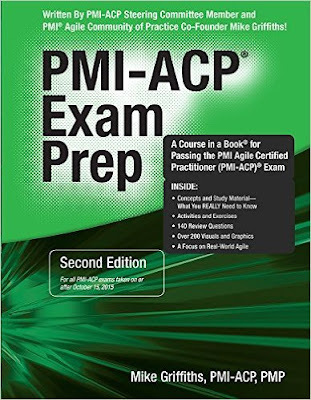 Unfortunately, there isn’t an AgileBOK per se (a reference standard similar to the PMBOK Guide) for the PMI-ACP exam. The PMI-ACP exam is based on 12 reference books on Agile. Reading those 12 books is highly recommended for anyone interested in learning Agile, but it’s not really required for passing the PMI-ACP exam. Fortunately, there are good study guides in the market that can help you pass the PMI-ACP exam. This post is a short review of one such study guide - PMI-ACP Exam Prep by Mike Griffiths. Mike Griffiths is a renowned project manager, trainer, consultant and writer, holding multiple project management and Agile-related certifications. But more importantly for PMI-ACP aspirants, he was a member of the PMI-ACP certification steering committee. The fact that the guide is authored by someone who was involved in creating the certification makes it the unofficial official study guide! Mike has taken the essence of the 12 Agile reference guides and distilled them into a conversation-style, easy to read and to-the-point study guide for PMI-ACP. The guide clearly outlines what you need to know for the exam and what you don’t. It saves a lot of preparation time that would otherwise be wasted in studying for topics not included in the exam. Mike does tend to assume some familiarity with the PMBOK Guide, but it’s not really significant. The guide provides plenty of short exercises, which are quite interesting and mighty useful in reinforcing the concepts. However, the end-of-the-chapter sample questions are somewhat easier than the questions on the real exam. So, don’t get complacent even if you score 90% on those questions. Overall, the guide has about 120 sample questions, the same number as on the PMI-ACP exam. One striking aspect of the guide is the liberal use of visuals. It’s an absolute joy for the visually-oriented like me. The addition of green color in text and visuals gives it a refreshing look. The top-notch quality print, paper and binding really top it off to give it a premium feel. The price of the guide (about ~ USD 67) is definitely on the higher side, but it’s really worth it in my opinion. The only downside is the lack of an electronic version. It means that you cannot read it on your favorite iPads, Galaxy Tabs and Kindles, and must lug around a 5-pound block of weight. I have absolutely no hesitation in recommending this guide. It’s one of the best study guides that I’ve ever come across. You simply cannot go wrong with it. If you are preparing for the PMI-ACP exam, then this guide is a must-have. Harwinder, I totally agree with you on the review of Mike's book. I have purchased this book on amazon and once I had a look at it , its an absolute delight. It has re-instilled a sense of purpose in me to pursue PMI-ACP exam prep without any hesitation and delays. Much earlier I have purchased PMI-ACP prep book from Pearson (Chandramouli and Saikat Dutt). But its a very boring read. It didn't help me in moving quick in my preparations. Although there are four full-length model test papers and scores of chapter-end questions, most of them are fact based and requires you to memorize. I too strongly recommend Mike Griffith's book on PMI-ACP Exam Prep. Thanks for your detailed review. I have just completed one round of reading of this book and i do agree that the book is good. I was able to skim through the book very fast like reading a story. But there were times i felt that he is writing many paragraphs that could have been conveyed in just one sentence. That is, keep is short. Many things are repeated over and over again in many chapters. Only one things i would like to know: whether i need to memorize anything for the exam? which i'm not fond of! I also wonder how Rita would have written if she was still with us. I really liked her no-nonsense approach of PMP prep book.